USA – -(Ammoland.com)- Palmetto State Armory has a package deal on their PSA 10.5″ Upper with a Back-Up Sight Set and a Vortex SPARC for just $349.99 and FREE Shipping. This is a great deal as the Vortex SPARC is $200 most places online, even Amazon can not beat this deal. 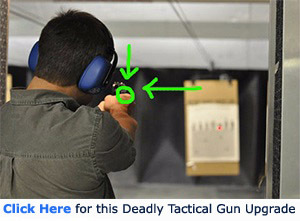 Not to mention that back-up gun sights sets are another $50-$90 most everywhere. Barrel: 10.5″ 4150V Chrome Moly vanadium steel barrel, phosphate coated and chambered in 5.56 NATO with a 1 in 7″ twist. This carbine-length gas barrel is finished off with a PSA 12″ Slant End M-Lok Rail, a low profile gas block, and a PSA Fluted Flash Can. Simple—Fast—Effective—Point and Shoot. When you boil it down, those are the advantages of a red dot sight. And that’s what the SPARC AR delivers – all in a durable, lightweight, compact, and ultra-clean package. Digital rear-facing controls for power and dot brightness offer quick access and are viewable from the shooting position. 2 MOA dot diameter promotes a precise point of aim and automatically returns to last dot intensity used when powered up.